This Sept. 23, 2012 photo from the Audubon Nature Institute shows a bottlenose dolphin with a gunshot wound near the blowhole. 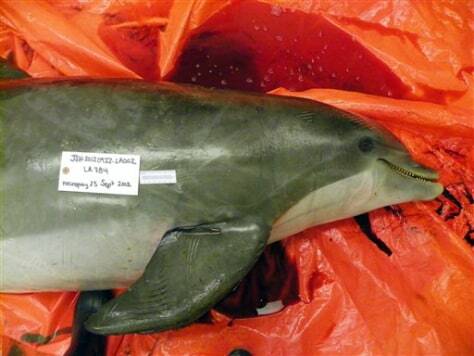 The dead dolphin was found near Elmer's Island, Louisiana. Dolphins are washing up on shore with bullets wounds, jaws and tails missing, heartbreaking discoveries for scientists along the Gulf Coast.